In my last installment regarding the restoration of my 1967 E-Type, I discussed installation of carpet and other coverings along the floors and sides of the footwells. 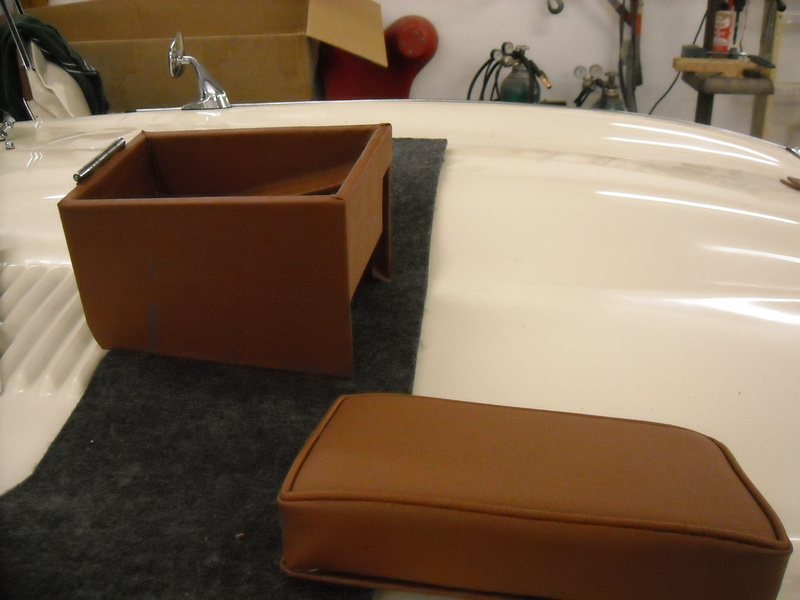 This month I’ll discuss upholstery work on the center console and arm rest. 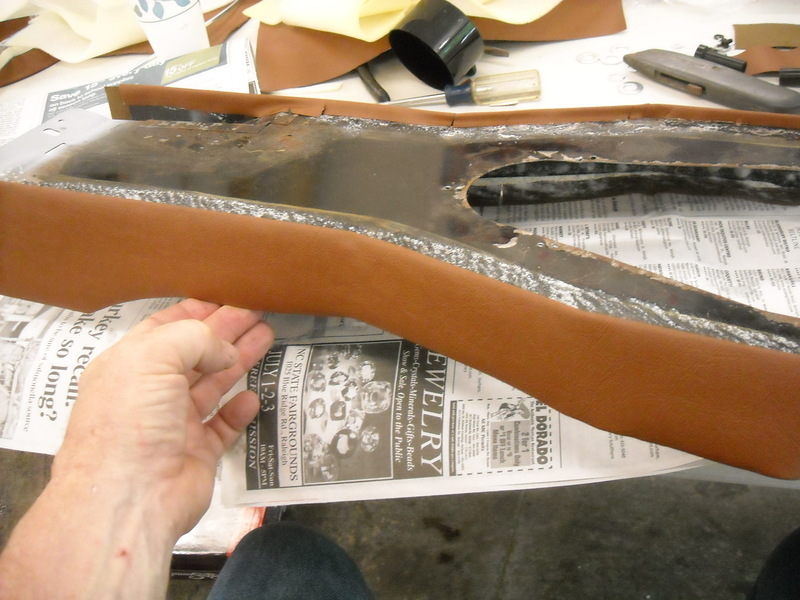 Before I applied any upholstery, I did some test fitting of the bare metal parts. One potential problem with the fit of the console that holds the radio and the ashtray is that if it is not fit correctly, you will not be able to lower the hinged center panel that holds the gauges and allows access to the fuses. This is a common complaint and is most likely due to the console sitting too high on the carpet. In my case, I had added Kool Mat insulation which held the console up in a higher position. I wound up removing metal from the bottom of the console to get it back into the right position with the Kool Mat and the carpet installed. Once the console was fitting correctly, I could then go ahead and fit the vinyl and leather to its exterior. The ashtray is upholstered separately. I also installed the Retro Sound radio, in this case one that I sourced from XKs Unlimited. This radio is very nifty in that the shafts for the knobs can be adjusted to a wide range of positions. It is also modern in that it supports digital files from an Ipod or similar. Various faceplates are available. I choose the Blaupunkt look. The console that sits between the storage cubby and the radio is affectionately known as the “ski slope”. 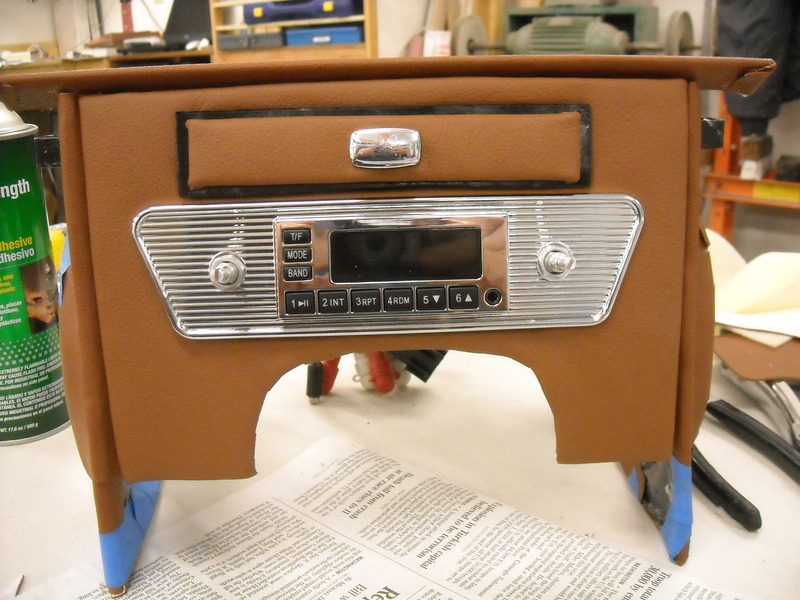 Like the face of the radio console, it is covered in leather. Shaping and gluing the leather over the plywood backing board was fairly straight forward. It is trimmed in vinyl on the sides, which was also straight forward. I apologize that I don’t have a picture of the flat, “Y” shaped portion of the center console. It fits over the black area shown in the above picture. This is a piece of ~1/4″ plywood. 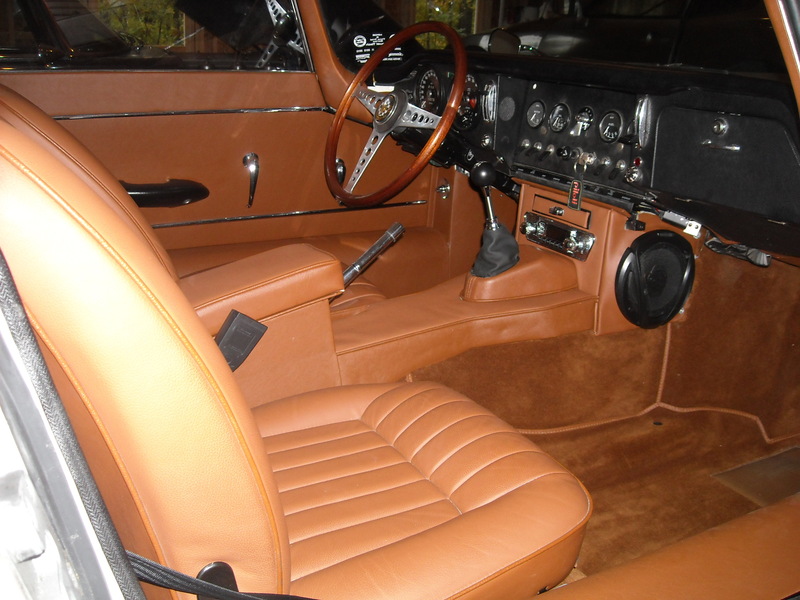 Unlike the sides of the center console, which are covered in vinyl, the flat Y portion is covered in leather. This is only slightly tricky in that you have snip cuts around the edges of the curved portion to allow it to fold around the edges without puckers. There is also a piping piece, supplied in my case by BAS, that glues to the inside and outside of the Y. The plywood is held in place with screws from underneath. Next I turned my attention to the “shift dome”. This is an extremely challenging piece to upholster. The original covering was a thin vinyl that appeared to have been “vacuum formed” over the dome shape. I made a call to my upholstery supplier. They said that they stretched vinyl over the dome when they did them in house. I was dubious. I had pieces of vinyl left, one with a cloth backing and one without. I did some experiments on some small pieces to see how they would react to stretching, both at room temperature and with application of heat. I found that the piece with the cloth backing would stretch the best but only at a 45 degree angle to the direction of the cloth threads. With application of a lot of force and some heat, I got the piece fairly close. Even so, I wound up having to sew a seam at the rear edge to make it look decent. There is also a black leather gaiter that fits over the shift lever. 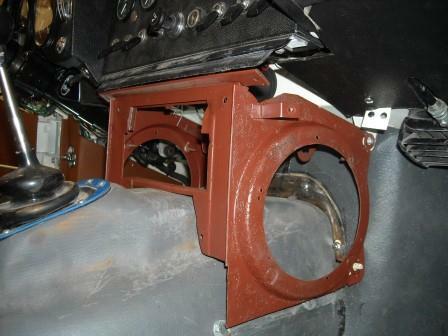 I attached it’s lower half with screws below the shift dome. The upper visible part is held in place with a chrome bezel assembly that I purchased from SNG Barrett. Finally, I turned my attention to the storage cubby / armrest. The top of the armrest is padded and has a perimeter bead. 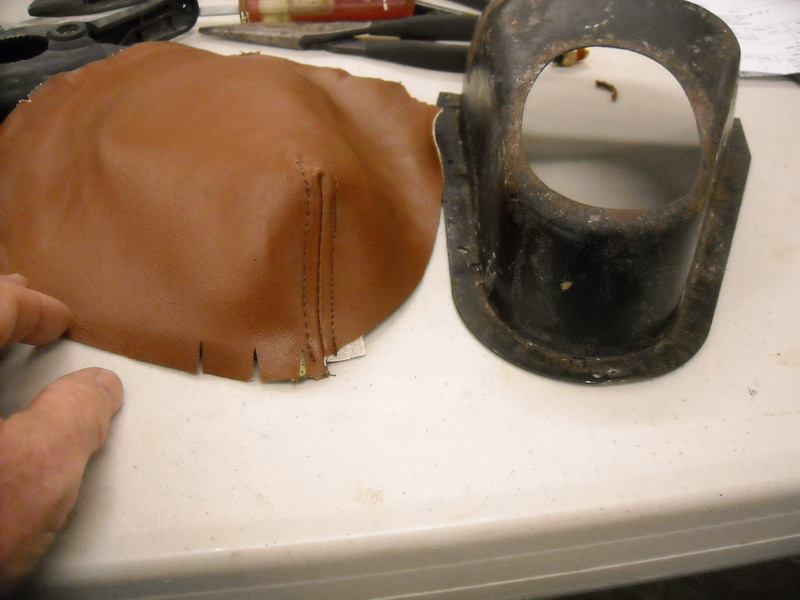 The upholstery supplier had provided this piece pre-sewn so that it was a fairly simple effort to apply to the lid. The rest of the box was also pretty straight forward, similar to wrapping a package. I also applied vinyl to a custom digital gauge that I have installed inside the storage box. One last surprise awaited me as I assembled all the pieces into place. As I started up the car for a brief drive I found that the shift lever would not reliably stay in first or third gear. The problem is that the clearance of the shift dome is very critical. Mine was pushed a small distance to rear, causing the gearshift lever to be pushed slightly backward. I had to disassemble the parts and fiddle with things. I eventually got everything lined up so that the gearshift lever was perfectly centered and shifting returned to normal. It was quite a thrill to step back and admire the virtually complete cockpit area. All of a sudden, it was looking like a very luxurious grand touring car!